Keeping seniors socially active can be just about as important to their health as taking their medicine and exercising. According to multiple studies, spending more time with friends and family leads to longer and higher-quality lives for older adults. Tara said seniors who don’t have regular social opportunities tend to become inactive and reclusive, which can lead their health into a downward spiral. Improved mental health – About 7 million seniors across the United States suffer from depression. Regular social interaction is one of the best ways to address it. People who have friends or family with whom they can share their thoughts and concerns are less likely to suffer from stress and tend to sleep better. Studies also find that seniors who are socially active tend to experience less memory loss than those who don’t interact regularly. Better physical health – Seniors with active social lives typically are in better health than their peers who don’t interact with others. They have lower blood pressure, more resilient immune systems and, because they tend to be more active, they have fewer aches and pains and health complications associated with a lack of exercise. Improved nutrition – Seniors who get out and socialize are more likely to eat more regularly and consume higher-quality meals. People who live alone often don’t maintain healthy diets – and, because they don’t feel it’s worthwhile to cook for one, they sometimes skip meals altogether. More than 35 percent of seniors suffer from malnutrition, and most of them don’t have regular social interaction. A sense of purpose – Spending time with people we care about is what life is all about. Keeping up with events in their family or in the news reminds seniors that they are needed and that they make a difference. Visiting with others tends to make people have a more positive outlook and improves their self-esteem. Social opportunities are all around us! Staying active and engaged as a senior does not have to be difficult. Next time you or your senior loved one is in need of interaction, try the tips below. Go visit them! Even if your senior is independent, that doesn’t mean they don’t get lonely or depressed. Show them they’re important to you by making regular visits a priority. Take them out to eat, go to a show, go shopping or whatever else they like to do. Find a support group – Seniors are likely to have lost their parents and have often lost siblings, friends and even their spouse. There are also support groups specifically for senior veterans. It’s helpful for seniors to be able to talk to someone about the way they feel, especially when that person is of a similar age and experience can relate to their situation. Find some volunteer work – Donating their time to a cause for which they care — maybe at their church, a shelter, a hospice organization or other group – is a great way to keep seniors busy. It improves their self-esteem and their sense of feeling needed. Suggest a new hobby – A regular trip to the gym for a workout, a cooking class, learning to play a game like chess or joining a sewing circle are examples of activities that give older Americans a chance to meet and have conversations with others. Consider independent living – If mom or dad lives alone, they may feel isolated in their house. Maybe they’re overwhelmed by the upkeep and it keeps them from doing things they find more enjoyable. Independent living communities offer seniors dozens of social options right at their doorstep. 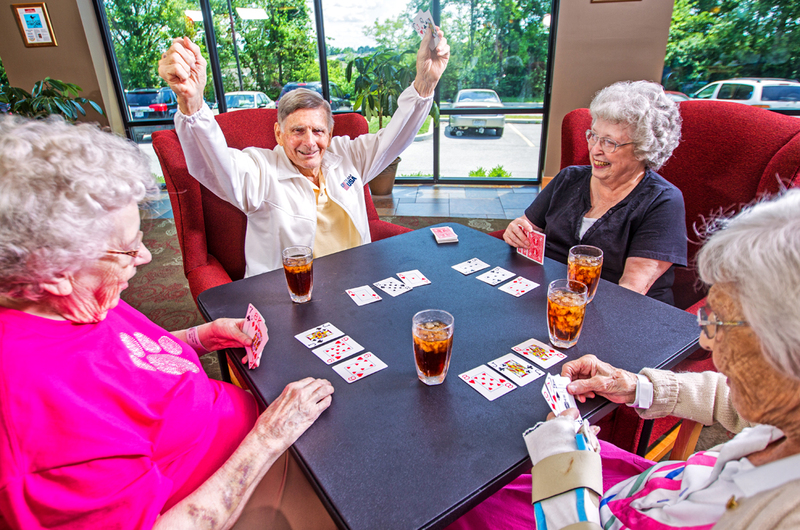 There are regular games, excursions and carefree meals during which seniors can get together with people that share common interests and experiences. It doesn’t have to be a big fuss. Most seniors just would like a little something to look forward to every few days, Tara mentions. It’s the company, not the activity that matters most. Bethesda’s communities host many social groups and offer multiple activities which give seniors the opportunity to stay in touch with their community and their peers. To learn more about our Independent Retirement Living communities in the St. Louis area, contact us to schedule a tour at a community near you.